Italy, Verona. Fredrick II, 1218 to 1250, billon denaro. Date : Issued by Friedrick II, ca. AD 1218 to 1250. Reference : Thompson #1940, Biaggi 2970. Size : 12.2 x 13.0 mm, scyphate. Weight : 0.38 grams. Obverse : Long cross with a circle on it. with a very crude inscription around. Various listings for the coin read the inscription differently, but are usually some variation on on CI VI CI VF with the F at the end backwards (retrograde). The reverse is on the concave side. 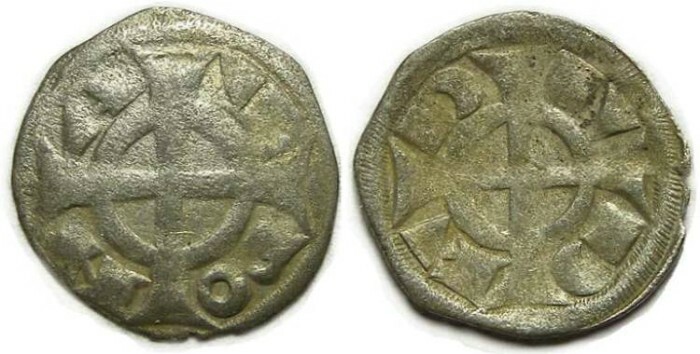 On the large coins of of Frederick II there are two rings of inscription and the inscriptions on these coins are the same as seen inner rings on those coins.Reverse : Long cross with a circle on it, with CIVI CIVI between the arms of the cross. The letters are crudely engraved, and some are retrograde, so difficult to read. The reverse is on the concave side.